Sternum pain – pain that occurs in the chest – can be scary and alarming as a potential heart problem. The sternum is the breastbone, which is a flat bone in the center of the chest – just before the collarbone. Divided into three parts – the manubrium, the body, and the xiphoid process – the sternum connects the rib bones with the help of cartilage. The sternum and the ribs are responsible for keeping internal organs, like the lungs and heart, safe. 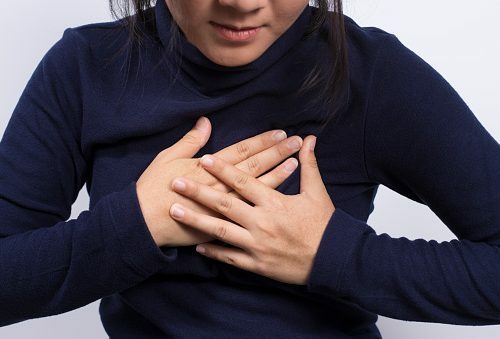 Unlike chest pains resulting from a cardiovascular event, sternum chest pain is often radiating and sharp. This pain often worsens with stretching and applying pressure to the area. In some cases, you may even notice a click or a cracking sound. Here we will outline the common causes of sternum pain along with treatment options. Heartburn: Heartburn sternum pain will be experienced in the lower parts of the sternum and is most common in pregnant women. This pain may radiate or shoot through the chest. If the pain does not radiate to the back or arms, or does not feel like a squeezing sensation, then there is no need for alarm. Costochondritis: This is the most common cause of sternum pain due to a minor injury to the sternum or rib cage. This is a result of overstressing the muscles or ligaments in the chest. The pain will worsen if pressure is applied to the area. Surgery: Undergoing surgery near the chest can result in sternum pain. Over time, the pain will diminish, but it may act up again during certain activities. Joint damage: Pain in the surrounding joints or even arthritis can result in sternum pain. This pain can worsen during certain activities or when lifting heavy items. Even heavy breathing can cause sternum pain if joint damage is the cause. Inflammation: The inflammation of the rib cage may contribute to sternum pain. This pain can worsen during movements or breathing. Excessive exercise, pneumonia, pleurisy, or tuberculosis are potential causes for inflammation in and around the sternum. Panic attack: Anxiety sufferers may experience sternum pain when they are having a panic attack. This is caused by stress and can resemble the symptoms of a heart attack. Being aware of your anxiety attack triggers can help you reduce its occurrence and thus lower your risk of experiencing sternum pain. Sternum fractures: In some cases, people may fracture the sternum itself, thus causing pain. This type of fracture is mainly caused by physical trauma, including a car accident or direct force to the sternum. Physical activity will be restricted with a sternum fracture, and your doctor may prescribe anti-inflammatory and pain medications. Although exercise is beneficial, it can result in sternum pain. This is because some people overexert themselves, which results in pulled muscles or even damage to the joints. It is always important that you follow proper form when exercising and know your limit. You should always increase exercise gradually as a means of reducing your injury risk. Furthermore, if sternum pain is specific to only the times when you run, there could be numerous causes as well, including gastrointestinal disorders, like acid reflux and inflammation. If you continue to experience sternum pain while exercising or running, speak to your doctor to diagnose the underlying cause and get a proper treatment. What type of treatment you require depends on the underlying cause of sternum pain. Here are some treatment methods based on common causes for sternum pain. Digestive issues: If pain is caused by digestive issues, you may require medication to treat your heartburn. Speak to your doctor about any chronic heartburn problems you may be experiencing. Anxiety: Become aware of your triggers and avoid them as much as possible. Practice calming techniques and reduce stress by slowing down your breathing. Inflammation and costochondritis: Anti-inflammatory medication and icing the chest can help reduce swelling. For costochondritis, applying a warm compress may relieve pain. If you have injured yourself, limit physical activity and be mindful of your movements. Sternum fracture: Seek medical attention especially if you are fainting, experiencing breathing problems, vomiting up blood, experiencing abdominal, back, or chest pains, as well as if you have a fever or notice reduced palpitations. Your doctor will perform tests to either confirm a fracture or confirm another cause like pneumonia. With symptoms like difficulty breathing, jaw pain, or pain that radiates to the arms or back, you should see your doctor immediately as it could be a signal of a heart attack. If you have frequent heart burns, you should also seek out medical attention. Lastly, if your sternum pain is accompanied by a fever, redness, or swelling, or any signs of an infection, see your doctor right away.